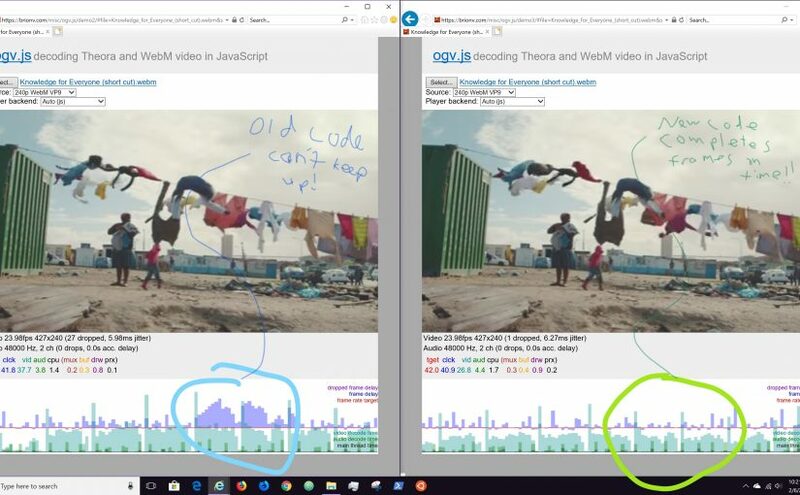 ogv.js is a web video & audio playback engine for supporting the free & open Ogg and WebM formats in browsers that don’t support them natively, such as Safari, Edge, and Internet Explorer. We use it at Wikipedia and Wikimedia Commons, where we don’t currently allow the more common MP4 family of file formats due to patent concerns. IE 11, that old nemesis, still isn’t quite gone, and it’s definitely the hardest to support. 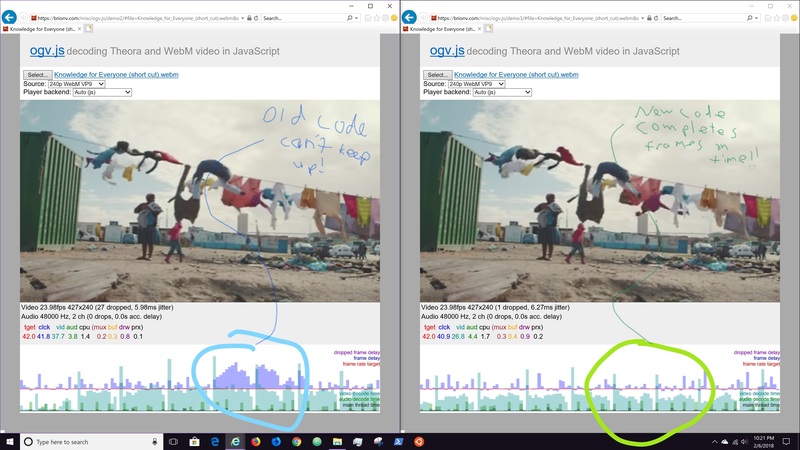 It’s several years old now, with all new improvements going only into Edge on Windows 10… so no WebAssembly, no asm.js optimizations, and in general it’s just kind of ….. vveerryy ssllooww compared to any more current browser. Profiling in IE is a bit tough since the dev tools often skew JS performance in weird directions… but always showed that a large bottleneck was the Math.imul polyfill. Math.imul, on supporting browsers, is a native function that implements 32-bit integer multiplication correctly and very very quickly, including all the weird overflow conditions that can result from multiplying large numbers — this is used in the asm.js code produced by the emscripten compiler to make sure that multiplication is both fast and correct. But on IE 11 it’s not present, so a replacement function (“polyfill”) is used by emscripten instead. This does several bit shifts, a couple multiplications, blah blah details, anyway even when the JIT compiler inlines the function, it’s slower than necessary. I hacked together a quick test to search the generated asm.js code for calls to the minified reference to Math.imul, and replace them with direct multiplication… and found significant performance improvements! This is about a 15-20% improvement, plus or minus, which seems a pretty significant bump!